If you are a Member at the Berkeley City Club, chances are, this months Member Mixer was one of your favorites with Chef Alaun’s food demo of Pâte à Choux. 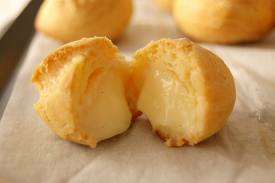 What is Pâte à Choux you are wondering, right? Don’t worry, I did too! 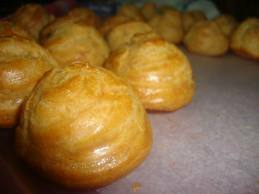 Pâte à choux is an airy cream-puff dough, which serves as the base for gougères, éclairs and many other exquisite treats. Here, a step-by-step tutorial in mastering the classic – for either a sweet or savory bite of deliciousness. Preheat oven to 350. Combine water, butter, sugar and salt in a saucepot. Bring to a simmer then add all the flour at once stirring constantly with a wooden spoon. Lower heat to medium-low and continue stirring mixture until a dough ball forms and the dough is pulling away easily from the sides of the saucepot. Remove saucepot from the heat and allow dough to cool for 1 minute. Stir in one egg at a time, making sure that the egg is completely incorporated into the dough before adding the next. Once all the eggs have been incorporated into the dough, transfer the choux pastry into a piping bag fitted with a 1/4″ to 1/2″ tip. 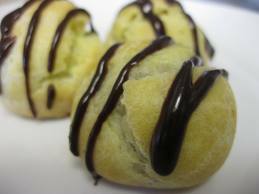 For cream puffs or gougeres, pipe the choux pastry into small rounds on parchment paper. Bake at 350 for 20-25 minutes until golden brown. Fill with the filling of your choice. Chef Alaun had a lovely assistant, Noel, on hand to serve up samples filled with a mouth-watering cheese inside, and you could also help yourself to a sample of a cream puff towards the end of the evening. I treated myself to one of each (a savory & sweet). They were each a little bite of decadence I was able to slowly enjoy. If you like to experiment in the kitchen, this one may be worth a try. If not, no worries, come strut into Julia’s and treat yourself to something amazing off of the menu. I bet you will leave happy and pampered. Julia’s is open for Lunch Tuesday through Friday 11:30am-2pm and for Dinner Tuesday through Saturday 5pm-8:30pm. Reservations are available on Open Table or by calling 510.280.1547.